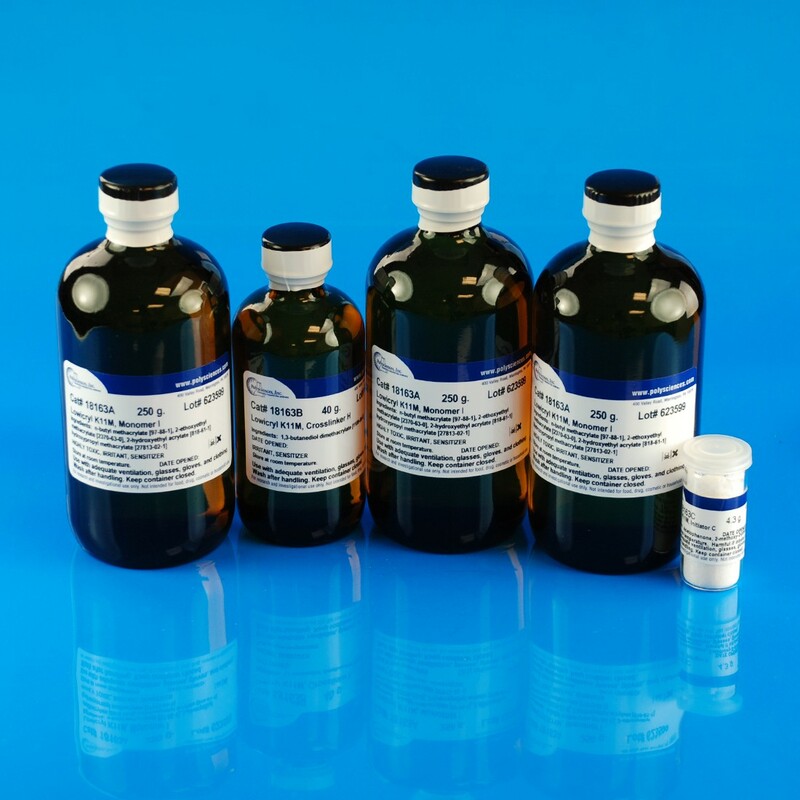 Lowicryls are low viscosity, crosslinked acrylate and methacrylate based embedding media. They are designed to preserve molecular structure/antigens by being applied at low temperatures. Because they preserve antigenicity, Lowicryls are a useful alternative to epoxy resins in immunochemistry. Lowicryl® K11M kit is a polar, hydrophilic, embedding media that is designed for tissue infiltration and polymerization down to −60ºC. During dehydration and infiltration specimens may be kept partially hydrated since polymerization can occur with up to 5% water. The use of K11M results in better structural preservation, improved preservation of antigenicity and lower background labeling. Kit contains: 3x250gm of monomer I, 1x40gm of crosslinker H, and 1x4.3 gm of initiator C.
Horowitz RA, Woodcock CL. (1992). Alternative staining methods for Lowicryl sections. J Histochem Cytochem. 40 (1): 123-133.